Tina's Crop Shop: OSAT Blog Hop - Birthday Bash! Hello! I hope you are having a fabulous week. It seems like March has come in like a Lion pretty much all over the country from what I can tell. We've had some beautiful weather to start out with but plenty of rain and thankfully not much wind damage around my neck of the woods! I hope things have been going well for you where ever you live. It is so sad to turn on the news and another hear of tornadoes throughout the country. It seems the Midwest has been hit especially hard lately! Since today is already the second Thursday in March, that means it's time for One Stamp At A Time Blog Hop! This month's theme is Birthday Bash and we have lots of inspiration for you along the way! If you've already been hopping, you should have landed here from Jennifer's fabulous blog! If you are starting with me, make sure you hop all the way through and don't miss any of the awesomeness that we have in store for you! Who doesn't love birthdays??!! I have recently purchased a few new stamp and dies set but one kit in particular was really calling my name for this blog hop, the fabulous Beautiful Butterflies Card Kit by My Favorite Things! Here's what I came up with... I hope you like it as much as I do! Aren't these butterflies absolutely gorgeous! It has an awesome sentiment set in the kit as well. 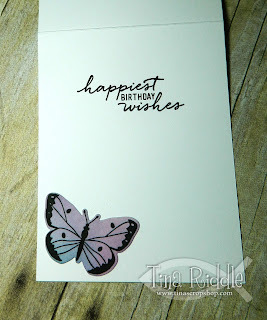 For my card and project I paired the butterflies with the gorgeous Perfectly Plaid paper stack from Lawn Fawn. If you love plaids, this is the paper stack for you. The colors just really scream Spring to me! My card base is an 11" x 4 1/4" piece of 110# Neenah Crest Solar White that was scored at 5 1/2" for a top folding note card. My top layer was a 5 1/2" x 4 1/4" piece of 80# Neenah Crest Solar White. I used my Tim Holtz Ink Blending Tool and Broken China Distress Ink to make a beautiful blue sky. I stamped my sentiment with Versafine Black Ink and heat set it. I added a strip of Plaid patterned Paper from the Perfectly Plaid Paper Stack and used a die from the Mama Elephant Borderline Trio Set to cut a decorative curved edge. I adhered it to my front and ran a piece of Natural Thread around it and tied it in a bow. 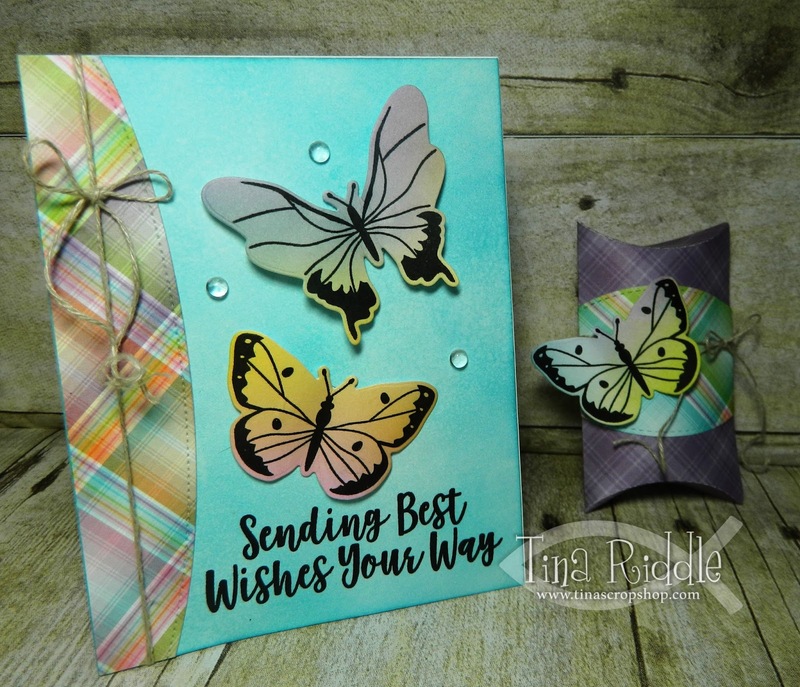 I used more of the 80# Neenah Crest Solar White and various Distress Inks to blend in some areas to stamp the butterflies with Versafine Black Ink. After dry, I cut them out with the coordinating dies. The inside was super simple with a stamped sentiment from my stash and another blended butterfly. I used a Sizzix Bigz Pillow Box Die to cut my Pillow Box out of more of the Lawn Fawn Perfectly Plaid Paper Stack. The band across the box is from My Favorite Things and was a freebie label die when I ordered the Beautiful Butterflies Kit and I'm not sure if it is available any longer as I believe they now have a new freebie. Of course I added more Natural Thread as well as another blended butterfly to finish off the pretty treat box. Thanks for stopping by! To continue on to Super Stamp Girl, Crystal Komara's amazing blog, just click the next button! Crystal always has some wonderful projects to share! Just in case you lose your way, below is the entire list of Bloggers on the Hop! So pretty! Love the Spring color palette! Tina, WOW! Absolutely gorgeous projects. I love the color scheme and butterflies. Always love pretty butterflies ❤. What a pretty ensemble! 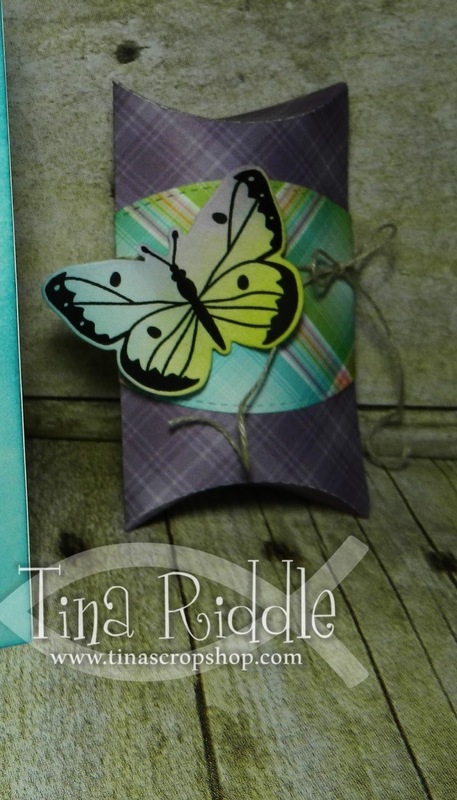 Love the color on the butterflies, especially paired with the plaid papers.